Ancient Battle: Rome is a unique game system designed by a team including a winner of the Ancients competition at the World Wargaming Championships. Originally designed from the ground up to give a unique wargaming experience on iPhone and iPad, the game will be arriving soon on Mac also. 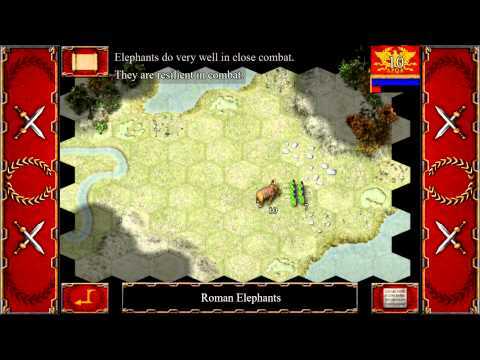 Players can use Roman legionaries, elephants, catapults, heavy and light cavalry, archers, slingers, fanatics, chariots and many more unit types to engage in classic battles. Included in the initial release is 'Caesars campaign in Gaul' culminating in the classic siege of Alesia, and the campaign between Julius Caesar and Pompey the Great. Players can also purchase an additional campaign of the invasion of Brittania with the highlight of Queen Boudicca's demise at the battle of Verulamum. Purchasable expansions include the battle for Germany where the Romans lost three legions in the Teutoburger forest, Its battles against Mithradates the Great in Pontus, and the infamous Parthia campaign where a whole Roman army perished in the desert. These later campaigns will also add fully armoured cataphracts, light cavalry archers, scythed chariots and the Greek Pike Phalanx to the game system. 8 Mission Gaul Campaign playable as Roman and Barbarian. 8 Mission Italy Campaign playable as Roman and Barbarian. Vast selection of Ancient Units. High Definition Ancient Era Graphics.